Oh my gosh, you guys. It has been colder here in New York than I have experienced in years, if ever. Even though I felt 1 degree temps in Utah, the serious wind chill in Manhattan has made this entire fashion week almost unbearable. It truly gives a new meaning to cab-to-curb. It clearly does not just apply to shoes! Living in Texas, I don’t own that many heavy coats. I’ve got a good selection of outerwear, but certainly not any that could stand up to these frigid temps for more than 10 minutes. That’s why layers were so, so important when packing for this trip! I brought with me a number of sweaters and thin knits to layer over each other (this Vince top and this J.Crew sweater are faves), a couple of fur vests (love this one and this one) and my favorite Heidi Wynne scarf to wear under my mid-weight coats. Another great way to layer is with jeans and over-the-knee boots. The ones I have been wearing are an old pair by Stuart Weitzman, but they are suede and seem to block out the chill I am feeling from the sharp winds. If you live up north, I definitely recommend picking up a pair of boots like the Lowland – it’s a newer style by Weitzman, featuring a slimmer leg and tie back. It’s great for daytime wear, but because it’s so streamlined, it also looks great under dresses for a night out! If over-the-knee isn’t your thing, check out this knee-high pair. Another slim fit, these boots are a gorgeous shade of taupe and will look great with white denim transitioning into spring! Gorgeous coat! Love the berry hue. Stay warm the rest of this week!! Gorgeous look and this is one of my favorite look from you. Just perfect! 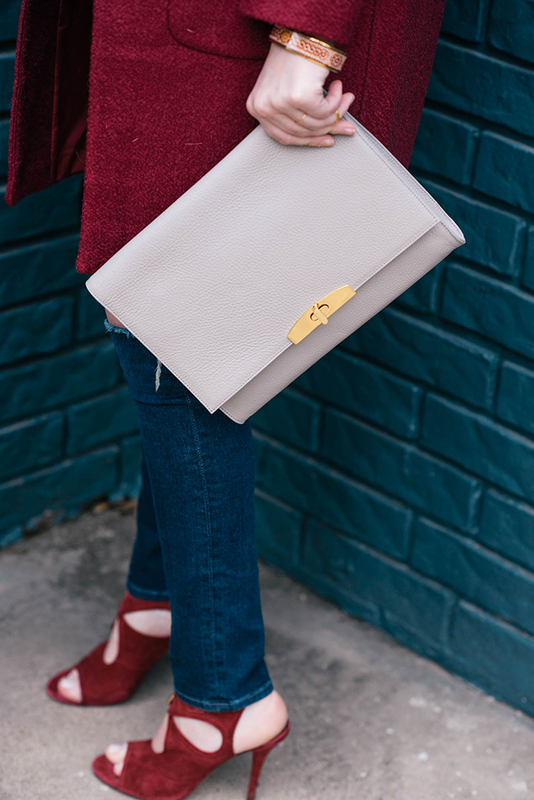 This color is so rich & beautiful on you – love that you matched it to your shoes! Stay warm in NYC!! That coat was a great find. The color is so rich! Love the red on red! Have fun at NYFW!! What a beautiful berry coat! I love the wall you found for the pictures too. It’s the perfect spot. NYC sounds so cold! I’m not sure I could handle it. I know, it is so brutal out there! Love the shade of that jacket, love all of the red and orange hues on the runway for fall. Stay warm! 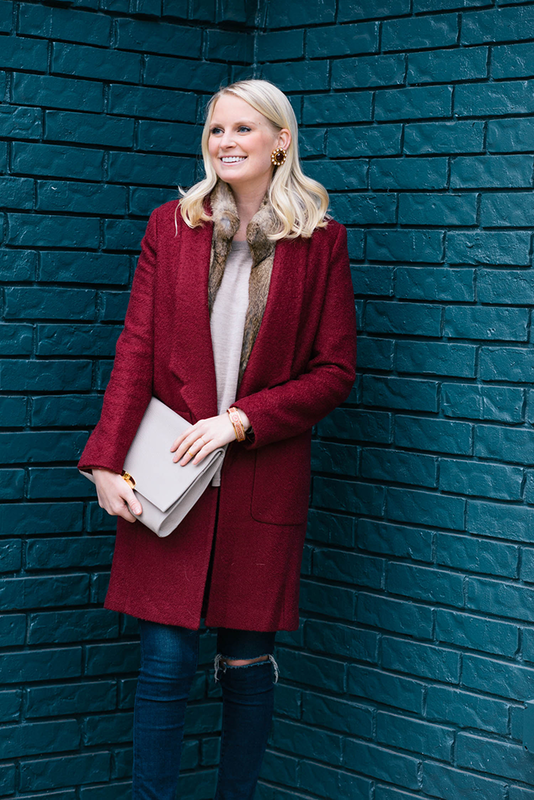 Love the berry color, and how your shoes match your coat! Stay warm! I’m freeezing for you! That coat is stunning! Love this! That color looks amazing on you! 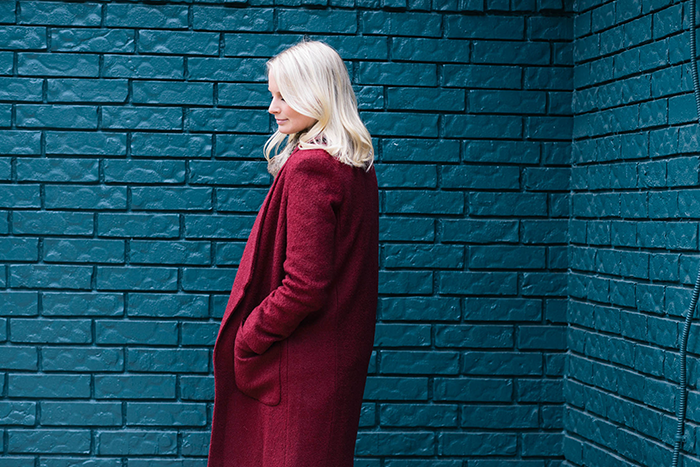 That coat is very beautiful and so are those shoes! The fur vest also gives your outfit a nice elegant touch. Stay warm, girl! LOVE the earrings! 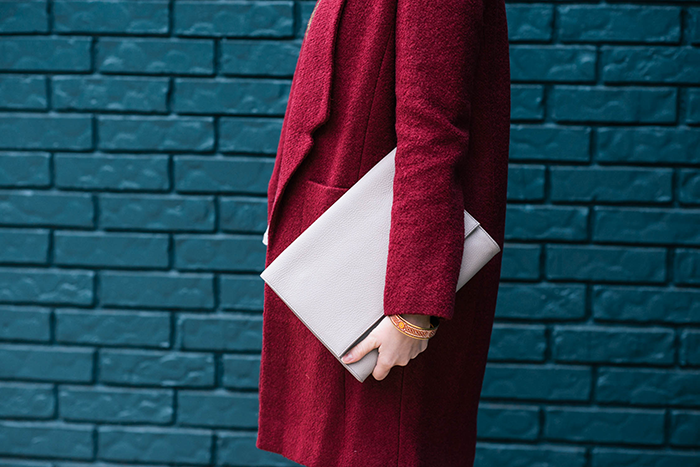 Love this color combo and layering! Stay warm and enjoy your time in NYC! This color is GORGEOUS on you! You seem to have the perfect coloring/hair color to make rich jewel and berry tones just POP! Haha and yes, even though I’m not going, I always enjoy that fashion week gives other bloggers just a small taste of what it’s like to blog on the east coast! And NYC is still much better than eastern Canada, where I am! The snow banks on my driveway are over my head now. It’s a little nuts. Hope you have a great time!! Oh my gosh your eyes POP in this color!! Nice coat. And of course I’m obsessed with the shoes. Try to keep warm, its back cold here in Texas today! 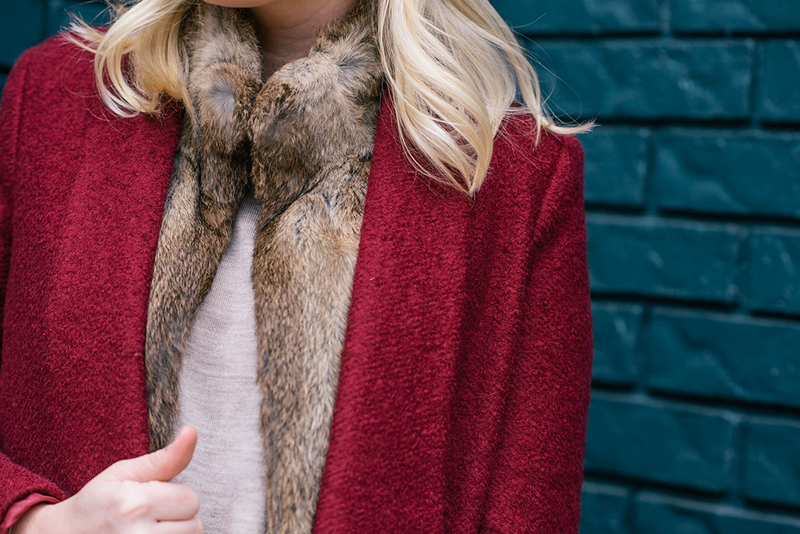 Love this color coat! It really looks great on you. gorgeous! Love that berry coat, and the fur vest peeking out. absolutely love this look – the colors are just gorgeous! But please tell me you didnt wear those heels in NYC… GOD its been beyond miserable here this week!!! 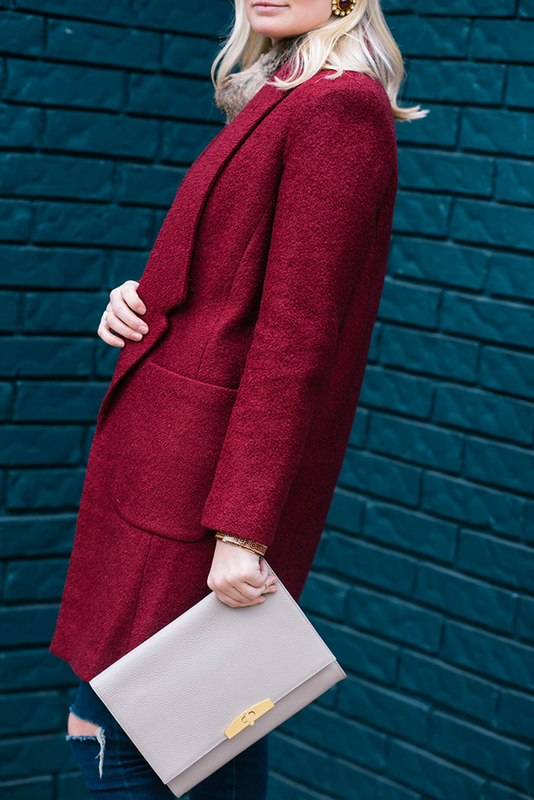 love the berry coat and the greybag against it !! I wanted to just say that I really appreciate that you’re more authentic than any of the fashion bloggers at the moment. You are the only one who wrote intelligent, thought out posts about what you saw at fashion week not just posts about what you wore and did. I also love that with a search on your blog you actually own and wear a lot of lela rose, that you were not just saying that you liked the designer because you got an invite to the show. So many people are really down on the fashion bloggers after this year’s fashion week, so many bloggers really poorly represent with overdoing it with their outfits, and being obnoxious about being at the shows which frankly are hardly difficult to get into nowadays. I really gained a lot of respect for you, great job covering the shows and blogging when everyone else was super super cheese. After reading your comment last night, I really wanted to take the time to respond and to say thank you. Fashion week (and bloggers) have gotten a lot of flack lately, and while I think some of the arguments are valid, others are not. Bloggers have paved a brand new industry that helps boost designers, established and new alike – both with brand exposure, but also with retail sales. While there are many bloggers who attend shows simply because they love the brands, and wear and/or talk about them on their sites, I would absolutely agree that the majority of bloggers are just there to say they were at fashion week and to get their picture taken. It’s so nice to know that readers are paying attention to these things! Thank you so much for following along – I’m so glad you’ve been enjoying my fashion week coverage and regular old blogging. :) I’m always open to feedback (good or bad), so feel free to email me or comment again if you have any questions, concerns or thoughts! I just wanted to say that I agree with the above commenter in that your coverage of the shows was so great and really enjoyable to read. ALSO, I love berry and red shades on you! Very pretty, Merritt. you look beautiful! I love the coat, however, does it have any buttons?